Pass along to a friend who also loves Lake Tahoe! The aspens throughout the sierra are starting to change – don’t miss Hope Valley! The annual Kokanee Salmon Festival and Oktoberfest, October 1 and 2 – what’s better than a couple steins of beer and a chilly morning 10k? Lake water warmer than the air for those morning paddles and ski pulls! 40 degree day/night temperature swings – wardrobe test! 6am headlamp runs before getting kids to school. The town has slowed down a bit, but real estate sales and rentals are still strong. Call us with any questions about selling, buying, or renting as we enjoy gorgeous fall weather! It’s time for the residents of South Lake Tahoe to employ one of their greatest characteristics with regard to affordable housing – creativity. Creativity is a prerequisite to thriving and sustaining in this town, it always has been. How many times has someone off the hill asked how you can make a living being here? We do it by willing it with creative, even experimental ideas, and now we need to do that together to put a halt to a terrible trend with housing. 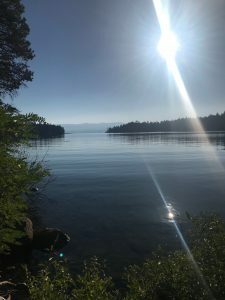 Awareness and anecdotes of the housing crunch for South Tahoe residents are on the rise, from the long-time renters being displaced with the recovery of homes prices and sales, to the school district struggling to recruit additional talent due to unattractive housing affordability. The good news? Now is the time to actively address the issue when we are feeling its effects most. Yes, economic cycles will continue to roll through, housing prices following, we know this. When the markets next soften we’ll see improvement in the housing affordability dilemma if left untouched – temporarily – but with it the town’s economic fortunes will have also taken a hit. Planning to make residential housing attainable means systematically exploring the components that we, the residents, creatively shout out. We must choose which elements to really focus on, have local teams actually in charge of leading them through, and when pulled together have a tangible plan of action. We need every bit of positive energy out there to drive this process to an impactful end – but it’s time to try some things! 1. Higher paying jobs come from the presence of businesses modeled for higher revenues than our typical resort town establishments. There is so much to sell here, from the flourishing schools and college to the improving infrastructure for communications. Access to Reno International is easy. Our gorgeous environment and associated regulations can find a way to support rehabilitation of existing sites for new business. 2. Remote work is real, it’s already here. Off the hill jobs that people bring with them or reach out and find help our economy with full-time residents, buying and occupying houses and actively participating in our community. Advertise this. 3. Help local buyers compete. Many locals are currently competing with investor cash for affordable housing under $350,000. Loans such as the FHA, which are designed to make housing more accessible to folks with smaller amounts of cash for down payment, are viewed as laborious and risky by some sellers. Can we propose an incentive to sellers, at the city/county/state level, to help even the playing field? What about a tax credit from the state for selling to a primary home occupant? 4. Should we re-institute a first-time home buyer program at the city and/or county level? There is always the downside of a downturn in home values, but the upside advantages to the community might make it worth the risk to a pool of public revenues. Locally, could we even look into using a portion of the existing taxes and fees generated on vacation rentals to incent local home ownership? High 80’s / Low 40’s, what’s new? There will be waiting, Pioneer Trail at Sierra House/Black Bart…the funnel by Sierra Blvd. Community town hall 8/17 to discuss affordable housing at Tahoe Beach Retreat. Lake Tahoe Community College with Sierra Nevada College now offering 4 year degrees in Global Business Management! What, spend college years in South Shore?? Set up a pre-move out walk through with the property managers. After reviewing your move-in check off list, they should give you suggestions on things that need to be done prior to move out such as thorough cleaning, professional carpet cleaning, yard clean up, small repairs like scuff marks on the walls/baseboards or soap residue in bathrooms, and any pet damage or evidence (If a pet was not allowed per the rental agreement you may be charged for deep cleaning and professional carpet cleaning at a minimum). If these items are not completed, the property manager will hire professionals and the fee will be taken out of your deposit. Return the keys on the day you stated you would move out. The owner of the property expects rent for each day the property is occupied, so even if you move out, but forget to return the keys or have to go back for one last thing, you will be charged rent as if still occupying the property. If the keys are not all returned, you will be charged a re-keying fee. Follow instructions such as leaving the heat on a low setting (not off in winter months), having all leftover trash hauled away prior to vacating, and leaving the property in as good as or better condition than when you moved in. Lastly, communication is key! If your move out date changes slightly, or something comes up, talking to your property manager about it is the best way to keep the communication lines open and on the positive side. Being a pro-active renter from the beginning and informing your property manager of any issues that need correction as you live in a property can greatly avoid you being blamed for issues that were on-going during your tenancy. Most property managers like to end tenant relationships on a good note and it’s always nice to give good references for your next housing situation and the tips above will definitely help with that – Happy moving! Welcome to our new website! 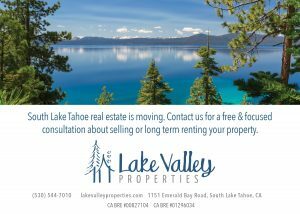 We are excited about our recent company changes – transitioning to complete long term and seasonal property management, and handing off the vacation rental program to Tahoe Select Rentals. If you’re looking for a vacation rental, please click on the Vacation Rental link on the home page where you will be redirected to a site dedicated to vacation rentals. Our new site is for people looking to invest in the local real estate market, looking for property management and people looking for seasonal or long term rentals. Mark Lucksinger has 38 years of experience in sales and our new web integrated IDX component on the website can make it simple for you to search local properties for sale. 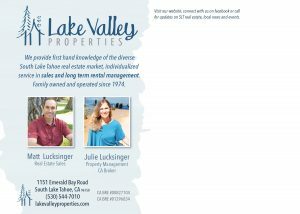 Marti and Julie have many, many years of experience on the management side and can help you with just about anything relating to your property management needs. Thanks for visiting and we’ll be posting on the blog with market updates, news and Lake Tahoe information in the months and years to come. We look forward to working with you!